What do you hold yourself and others accountable for? What are your core values against which you make your decisions at home, in your job, on the street…..? These simple questions have the most complicated anwers. When we consider the consequences of our choices than we could repeat the accountability question again. Definition of “Accountability” (Merriam Webster): an obligation or willingness to accept responsibility or to account for one’s actions . It hence is something else than responsability itself. Who is responsible for the global pollution for instance? And who is accountable? We probably anwer that we are all responsible but none of us is held or feels accountable. We either all are together or no one is specifically. Definition of Sustainocracy: Sustainable human progress (evolution according 5 predefined natural core conditions) and Democracy (our freedom to choose our priorities among those core conditions). 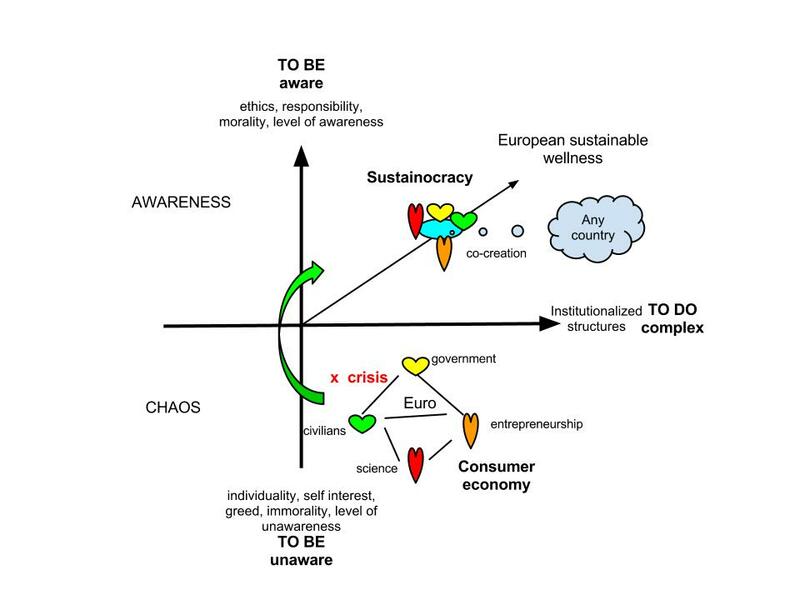 When I introduced Sustainocracy as new societal instrument for sustainable human progress in reality I invited ourselves and our institutions to become accountable for 5 core conditions for our sustainable wellness and evolutionary skills. Does it change anything in our lives? Not really as an individual, yet its effects are huge collectively. It simply affects the choices we make and against which we calibrate them. By doing so it modifies our discourse, our way of communicating with each other, our decisions, our design processes and the symbiotic interaction between people and institutions. The institutions start to deploy a new kind of commitment and operational activity while governance becomes oriented towards the proactive way of addressing and facilitating the development of these core conditions. For us individually it is just a choice, for our complex societies it represents a mayor turnaround. Does it affect our economies? Sure! It makes them resilient, strong, independent and sustainable. When we make our politicians, business leaders and scientists accountable for those core conditions too then they develop their decisions accordingly and we create a global community of progress and resilience. It is simple and resolves, even heals our complex societies and issues. Just try it and look at yourself and your surroundings from a core values Sustainocratic perspective. As a teaser you can download here our globally published “global health deal” after the example of the Brabants Health Deal. Join AiREAS (healthy city development from air quality perspective) and School of Talents (Participatory learning) as first sustainocratic cooperative models that work with this kind of accountability. After writting the blog about our entrapment in our own vulnerability we need to apply the law of opposites to show that breaking free is a serious option, applied by many around the world. It is not easy but once done a new world shows itself in which we can explore and develop ourselves to the full. We just need to accept reality as it is, not just the vulnerable part of greed and destruction but also the powerful part of awareness and creation. When we look at ourselves as a biological member of our human species we are a single complete genetic entity, a symbiotic composition of billions of species that interact to keep that unique human being aliveand alert. At biological level we eat, drink, breath, mate and procreate, and finally die within the cyclic event of life. Such human being is born absolutely free. Free to make our own choices for survival, safety and comfort within our habitat, planet Earth, and how we organize ourselves effectively. In the natural living space there is no debt, no ownership, just usage of resources and an adaptive interaction with other species based on equality and respect. In nature everything is always strong and healthy, the unhealthy and weak disappear to give back the resources to nature for another life cycle. This we call evolution and we as individuals and community are part of that. As citizen we are not free, we are part of a (formal) human group process. We have the ability to make arrangements in such group processes that help us live and survive, with safety and comfort, better than when we need to deal with this alone. In group processes we contribute as a member and interact with the group for best community performance. Communities tend to have unique characteristics that develop over time and may get into competition with each other for the protection of the group’s interest. 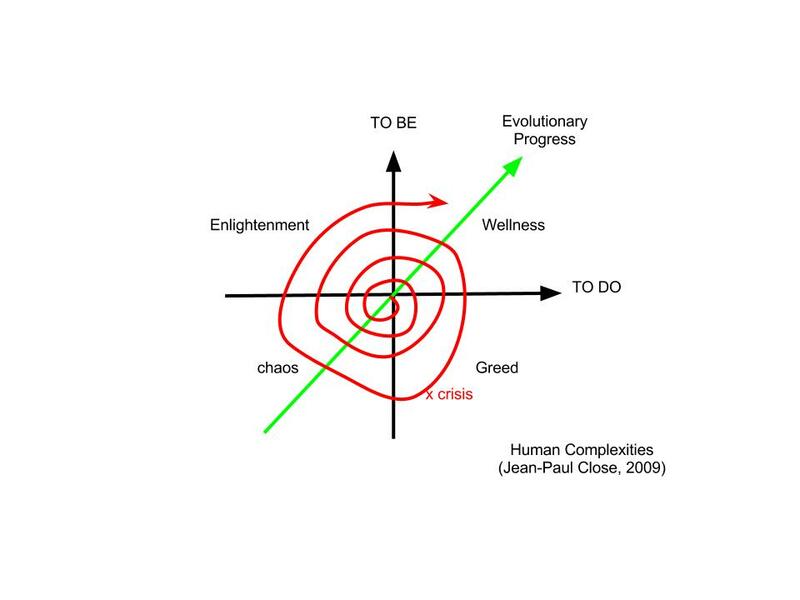 Communities also tend to behave like individual species with the same type of living complexity expressed in terms of growth (greed), chaos (crisis), awareness (learning) and harmony (balans). Within such communities a set of rules determine the interaction between the members. When such community serves its members than the citizenship is never questioned. When however the community starts serving itself as an institution, at the expense of its members, than an invisible line of tension is crossed and citizens can revert back to their human freedom of choice. They stop being citizen in THAT community. No other person can oblige any one to remain member of a community as active civilian if that person does not want to. Unfortunately it is done continuously with law enforcement or empowerment of governance. Still, in absolute sense, even when put in prison, one remains always free at human level. There are various ways to deal with the freedom of choice as human being and the obvious advantages of being member of a community. Of course this community needs to serve its members properly. The first option one has when stepping out as a citizen is to choose a new community which has a set of rules and behaviour that fits better one’s self aware judgments and desires. I myself had this option when I became aware that the Dutch society had outgrown its human community characteristics and became a money driven institution at the expense of humankind, essentially totally absorbed in the list of vulnerability described in the previous blog. But where would I go? Holland, at institutional and governance level had a reached a point of self destruction. But at humanitarian level we had gone through an evolution too. Equality between men and women for instance was a socially accepted truth. In the mind of certain analysts such equality was created to get women to enter the labor force and contribute to capitalist economics with all the negative side effects. This may be partially true but at the same time, from a human and universal complexity point of view the acceptance that men and women are the equal but not the same is key to understand universal ethics and dynamic clustering of life. In this duality of excessive institutionalized, money driven vulnerability and well balanced social equality, the Netherlands tends to offer a better evolutionary perspective than other communities where the money driven greed is not compensated by a minimum of gender equality. Another key element that motivates the stay in Holland is the freedom of speech and choice. The “system” may impose itself but when one turns its back to it there is an “isolation from the system” but not from the human part of society. In essence this too makes the Netherlands a vertile ground for the evolution of our species and experimentation with new structures of governance, culture and behavior. So leaving Holland was not an option. Only very few places in the world would give me the level of freedom to evolve into something new rather than revolve in a fight against the old. The second option one has is to create a community of one’s own, according one’s own insights and understanding. In a globalized political economic human world, fixated in its vulnerability but explained as a strength, such choice is extremely difficult. When I had to deal with this I made a distinction between the status of human being and freedom with that of citizen and community compliance. When looking at Holland, consisting of nearly 17 million inhabitants we can see 17 million human beings and nearly 17 million “compliant” citizens. Most of those citizens don’t realize their universal right to be free as human being. They take our community and its rules for granted. In such universal freedom there is no debt, no property, no human legal system, no religion, no guilt. There is a right to determine or create community membership and citizenship. So when I address the fellow human being inmy surroundings then the conversation differs fundamentally from the address to the citizen. Even at professionalized level in the citizen’s world the so called “leaders” are also human beings. Often they are slave of the same system with the only difference that they are rewarded to make other people comply. I can address them also as human beings and challenge them to look at their citizen’s role in the community from a human perspective. Awareness is an awakening process which is best realized by taking people out of their mental or physical comfort zone. When I see the Dutch community as 17 million human beings that in potential can determine the characteristics of a totally new society, even though they are mostly actively and unaware involved in their old citizenship, then I can communicate with them as such. It does not matter in what role they operate in society, when they are invited to understand their human freedom we can openly reflect about change. When I started to do so in 2005 I found resonance with a very limited audience. Most people and structures were still confident that society as it was would remain. My own awareness had broken through in 2001 when I was taken out of my own mental and physical comfort zone and had to make my own decisions as human being, not as citizen. But the mental and physical comfort of the mayority of the Dutch back in 2005 was still happy with themselves. Only some resonance was gained in the field of entrepreneurship. Business people were encountering severe competition and needed to find ways to strengthen their proposition rather than continuously follow the decline of cost optimization in order to try to grown. In 2008 this all changed when the creditcrisis threw many people off their comfortable throne with a mental wake up effect. Suddenly all executives as well as people in general were in crisis. The first reaction is to try to get back to the old and safe status quo. The second reaction was to see if change was an option. Most people acted in this on professional level, using the known instruments for that particular function and old societal context trying to make the best of it. No one had ever considered looking at it from their human perspective until I started inviting them to do so. Once we have been through the process of relativation of our human and citizen’s choices we start looking at reality in a totally different way. The vulnerability described before becomes an innovative challenge and the core human values a guideline. 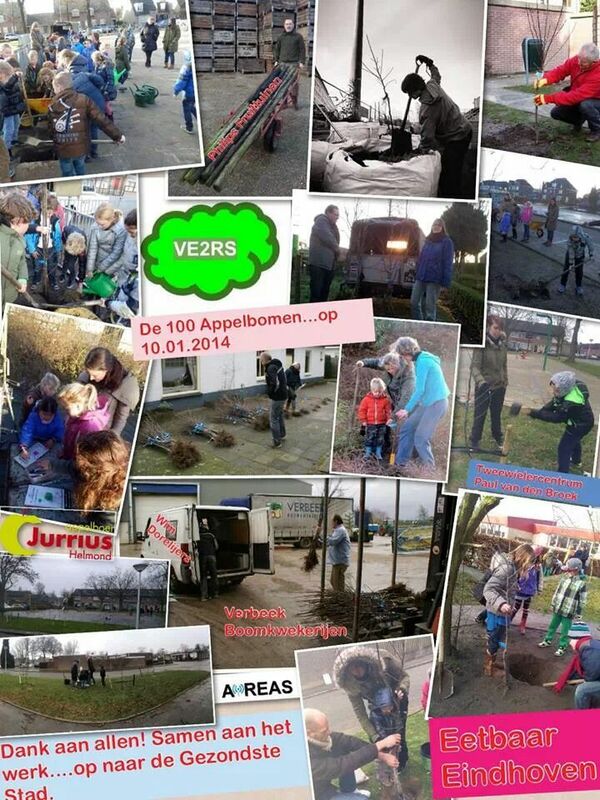 We cannot change 5000 years of city development over night but we can start with small steps. Some cities and regions are more difficult to transform from a quality of life perspective. Some even impossible. Knowing this we can even anticipate creating totally new living environments for the millions of people that otherwise would remain in a vulnerable situation. In the old reality of money driven citizenship this would be seen as a tremendous cost. In our new reality of core values driven cocreation it is seen as the engagement to make a difference between death and life. New techniques, visions, ideologies and methods can be experimented with to generate public engagement with the proper reward. Life is a great reward but when alive we need to have a house, food and other needs that we need to cocreate together too. Recently we looked for instance at the potential of the Pyramide City as self built, 100% self sufficient solution for all our unemployed and refugees. 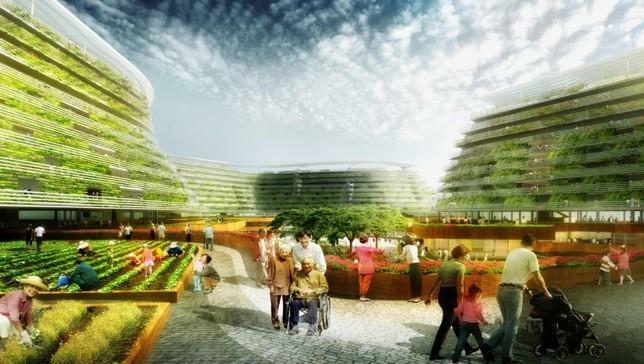 We can house over 6000 people on 1 km2 using local materials and building a totally circular economy. The pyramide city can be built locally by the local people in exchange for free housing and self sufficiency once ready. It is a totally different way of organizing ourselves in which no political or economic parameters rule, nor a democratic hierarchy of self interests, but a cocreative mentality of everyone involved based on developing and maintaining our core values. 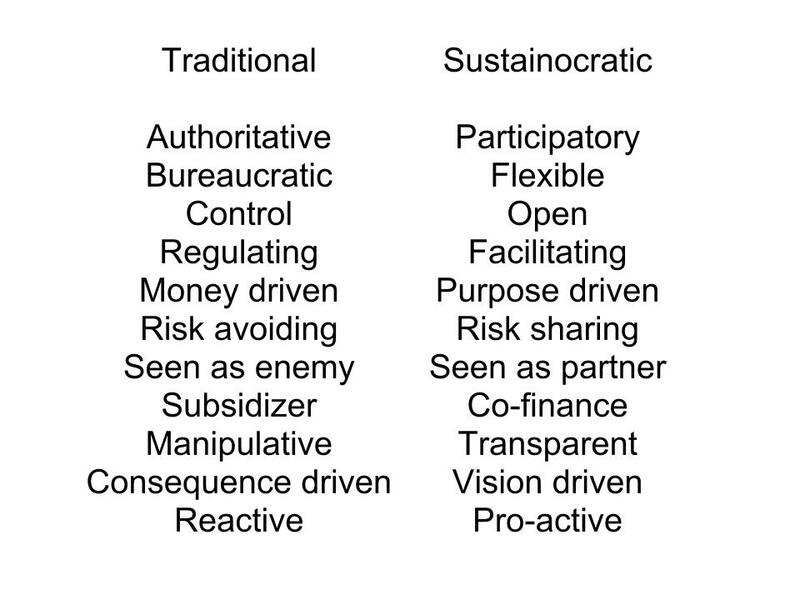 We even defined this as Sustainocracy, a new type of democracy that respects authorities and professional specilizations but connects them in a new way around core challenges. The individual choice is hence not just in distinction between human and civilian realities but also in the way we contribute to progress with our professional responsibility and authority. When individuals become aware of their human freedom of choice and the ability to redefine their conribution to sustainable human progress two realities get organized in parallel, the old vulnerable one that produced old securities and wellness but got us into trouble, and the new one that creates new securities by addressing the vulnerability through the leadership of core human rather than financial values. While in the money based reality the relationships are built around financial transactions we see that the reality around core human values is built around project based cocreation and sharing of values. In money based city the citizen is a consumer of the city’s consumables (health care, housing, roads, parking, shops, theaters, events, etc) while in a core human values based community every person is a partner and participant sharing the progress and value creation. This means that a totally new value system is introduced, based on cocreation effort and sharing. This is not a relationship based on individual greed and dependence but of sharing and freedom. Traditional infrastructural functions of governance are still needed but they are facilitating this participatory awareness driven eco-system based on harmonization instead of economic growth. This gives a significant different meaning to government and others in the field of cocreation. Technologies feed cocreation and awareness, not control and regulation. Governance, lawsystems, innovation, education and entrepreneurship get a totally new meaning and organization. With appearance of two realities in one community one can live up to one or the other. Much better is to place both into perspective of eachother and relate them functionally. Suddenly we find that a large part of the old functional reality may remain alive and working blindly in the part that is claimed to produce vulnerability. Key is that the emphasys of our community direction is not anymore based on blind economic growth yet positioned at the side of values driven change. This does not mean that the economic growth parties are eliminate, not at all and on the contrary. Economic growth is good as long as it contributes to the solution rather than producing the problems. Economic growth will never challenge itself out of self interest. We need to have something beside which we call the Transformation Economy. Such economy keeps a look at the core human values and determines when the cocreative change is needed because the Growth economy crossed the line and started to produce measureable problems. Rather than raising taxes the Transformation economy raises royalties over the innovations that produce and enhance the core values while penalizing those old growth elements that measurably started to contribute to the problem. Like that the Transformation economy garantees the involvement of the specialized organization while redefining solutions through open innovation as these organizations are the ones that fragment the solutions into new products and services for the world market. Most of the current world is active on the financial leadership side. Positioning the new reality on the side of sustainable leadership will strengthen and consolidate the transaction economy rather than making it vulnerable. We have arrived at the conclusion that all our problems are solved instantly if we make our simplest choice. As human being we are free and responsible for our sustainable human progress. Once aware of that we can embrase the 5 core values and position ourselves at the side of sustainable leadership and the transformation economy. Our vulnerability is our challenge not our burden and our creativity and cocreation is our security for a safe future. Money is a means that may conditionally grow as long as it remains contributing to the global core values else we voluntarily change its content to something new. We don’t depend on banks, politicians or whatever to make this decision. When we do at our own human level we can invite others to join. As the consequences of our vulnerability grow there are more and more who are willing to chose the side of sustainable leadership and help restructure a society putting growth in balans with harmony. The cities, our places to live, our productivity and learning through awareness will then produce an evolutionary step for humankind. Life on Earth has evolved like this for 4.5 billion years. Now humankind can benefit from this unique awareness breakthrough and change our vulnerability in our strength. We don’t need to die, we need to learn how to live and act accordingly. 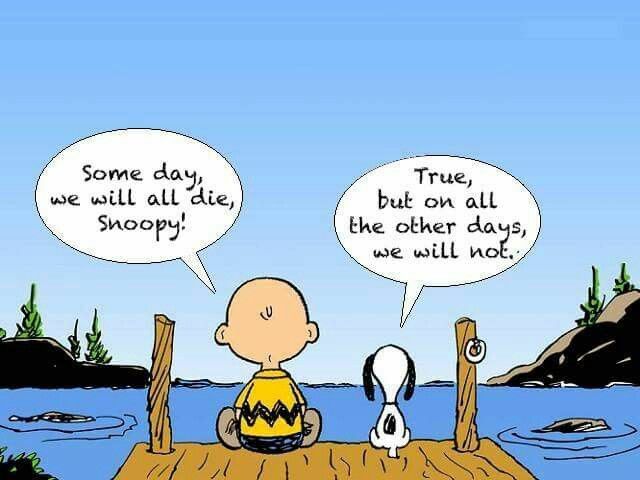 We can only confirm what Snoopy and Charly Brown conversed and take the positive way. City development is a human path along ethical breakthroughs and value driven leadership, based on wellness and harmony. Some cities in the world take the lead (eg New York, Eindhoven). Many others show horrible signs of decadence, speculation and chaos. Using the complexity model (organization versus ethics, TO DO versus TO BE) in relation to the impressive explosive expansion of cities we can see that the city environment has become the utmost melting pot of speculative decadence and an ethical leadership challenge without precedence. The expansion leap of the city is especially spectacular from 1950 onwards. It is fully in line with the mathematical exponential function of doubling over a fixed time 1, 2, 4, 8, 16, 32, 64 etc) as explained so magnificently by Dr. Bartlett in 2002 and so neglected by the general people out of unawareness or complexity while manipulated by self interest of banks and governments. Where does ethics come in when a doubling time of just 30 years requires millions of homes to be built and financed? When all this spectacular affluence of people needs food to eat, energy in their homes, products, services and medical care to overcome their accidents and illnesses? Where is it when all the above has been economized in controlling hands of politicians, bureaucrats, banks and competitive business enterprises that only have growth on their mind of power and control? What happens when all this needs to be connected with infrastructures of roads, logistics and waste management? Where does one place priorities? For decades the choice was obvious. Attending “Growth” had priority number 1 and was complicated enough to manage and interesting enough for greed and apathy to develop hand in hand. The total lack of ethics results in unprecedented levels of pollution, sickness and ghetto forming, even in modern cities of the western world. The distance between rich and poor grows including decadence at both extreems. Secondary consequences, such as air and water pollution, criminality, sustainability issues in humanitarian and ecological ethics, etc. are unfortunate burdens that did not immediately fit into the expansion model of working with political or economic priorities of growth. All this is crazy if we realize that placing all 7 billion human beings sholder to sholder in rows “bud to belly”, the entire world population would fit into the smallest province of the Netherlands (Utrecht). 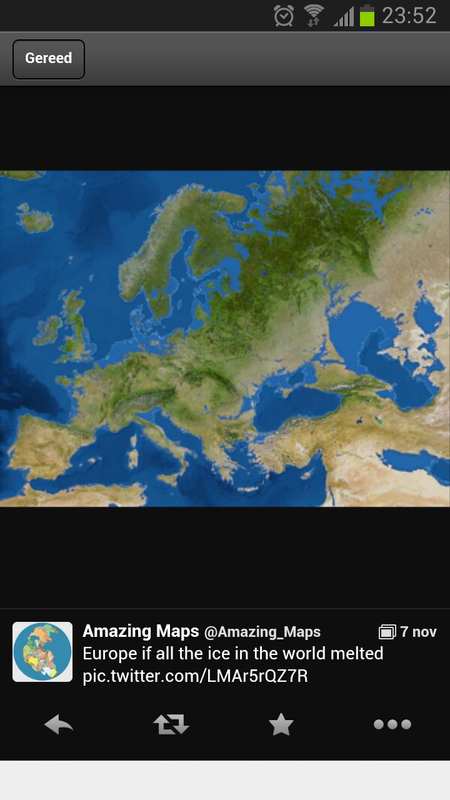 And many know how small the Netherlands is already. 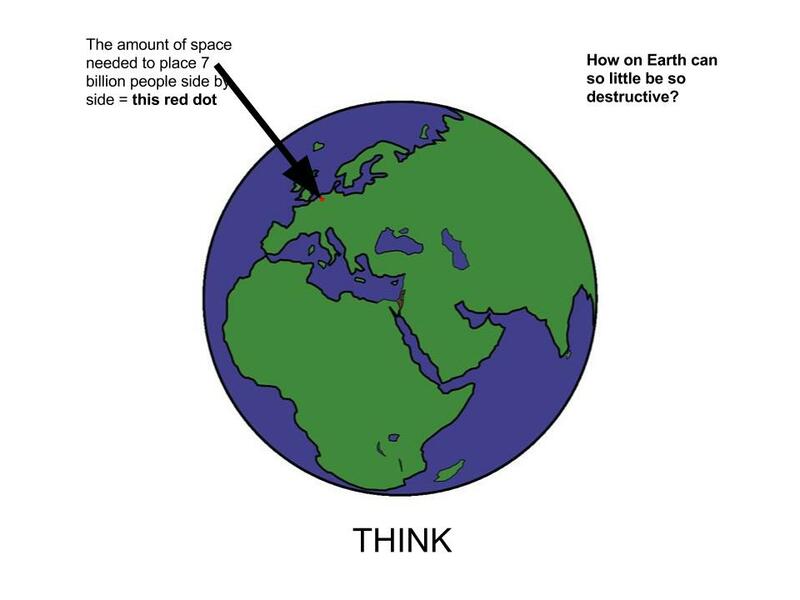 If all people together occupy so little space why are we such a huge, destructive footprint on our planet Earth? That’s because we use our time, space, creativity and interaction wrongly. The cities have grown so big, complex, problematic and vulnerable from management point of view that a new way of dealing with its household and community interaction is needed. The old bureaucratic model of tax versus expenses does not cover the needs anymore. Nor does the model of consumer economics that make people in cities extremely vulnerable for financial speculation, destruction of values, illnesses, etc. Cities tend to run into severe debt while responsibility piles up without apparent solutions in the old model. Rosling addresses the paradox of ethical need of child survival to stop the exponential expansion of the human population. He refers also to the moral need to bring together wellness by taking responsibility together. His logic makes sense even though the complexity of harmonic interaction with our environment with involvement of all structures of society was only briefly referred to. As mentioned there are very powerful speculative forces at work that have always gone beyond governance control, facilitated by politics from the economic interest point view. Take for instance the tremendous food requirement for such large city populations (70% of all people in the world are consumers through money dependence in cities and they do not contribute to their food productivity) has stimulated the same speculants that corrupted the real estate market to do the same in the other commodities markets. When the masses stand up against their dictators. The Arabic spring was an example as a response to raising food prices. The Mexican youth movement in response to the student massacre by corrupt politicians and drug cartels, is yet another. 100’s of such hotspots can now be found in the world. And it spreads through social media and brave bottom up leadership. When crisis, catastrofes or depression give room for change. In many places fragmented power distribution makes executives aware that they cannot stop the public movement of change. The open up for dialoge and exchange their position of power to block for their authority facilitated change and gain admiration for that. When ethical leadership takes over from financial management. New value systems appear. They develop in parallel with old obsolete formal structures. They are not transactional but based on value creation and sharing. New organisational complexities arise that eventually take over from the old ones including the new level of ethics in their structure. Sustainocracy is a working example that invites executives from the old world to take responsibility also in the new one and bridge the transformation in a peaceful way. No matter what the outcome is per city the transformation processen are enormous because everything that evolved for centuries and especially the last few decades is being challenged to change. Many cities experience this as yet another cost but in Eindhoven we see it as a modern multidisciplinary value creation process, an emerging economy based on spirituality (the natural force of purpose driven living connectivity) and creativity (true 21st century entrepreneurship) that is more powerful than the old speculative one. The biggest difficulty is to transform a working city of cement and cars into a biodiversity of health, safety and productive interaction. We do not start from scratch but transform our past into sustainable progress. This will always go accompanied with tearing down old structures and developing new ones. Precedent appear allover the world but decadence and greed still rules. When ethics reaches the levels of global governance the human world will enter its next evolutionary phase. The 3 level of ethics, the one of harmony with ourselves and our environment. Transforming from one governance to the other needs others to become participatory too. In my personal opinion “knowledge” should be a common good for all people in the world, not just for those who can afford it. It hence has to flow freely to those places and people where it can be applied and prosper into positive human development, preferably “sustainable human progress“, which is the type of energy that the academy represents. The STIR Logo represents the interaction between our emotional, spiritual, physical and rational sensitivity to produce awareness and the development of our awakening conscience. Freedom of information distribution over internet is excellent but not exempt from unilateral disturbances, manipulation and information pollution. The human being lives in different realities of the consciousness, some artificially created by us ourselves. The responsibility to deal with information and its purpose is of the human being itself. Inspiration clustering, with the purpose of creating sustainable human progress by understanding life itself, is such responsibility with which we deal in STIR. And we love to share for the benefit of humankind! But we are not the only ones producing change or developing sustainable progress, insight and best practice. We don’t see STIR as a limitation restricted to our experiments with reality and progress. We see it as part of a global process that seeks connection to produce new, unprecedented evolutionary steps in our approach to human wellness and prosperity without endangering ourselves in the process. Everywhere around the world interesting and inspiring people are producing results in the field of sustainable progress. This deserves to be shared too. We can all learn from each other and try out the inspiration ourselves, no matter how complex. Global issues develop local solutions which can be applied globally. To share the inspiration we use the facilities of the internet in combination with local dialogue (hub) around its potential application. STIR Purpose: Redefining and implementing system’s complexities and sustainable human progress. By setting up STIR as a HUB (a room, good internet and people in to share information with) we can get the entire world to participate. 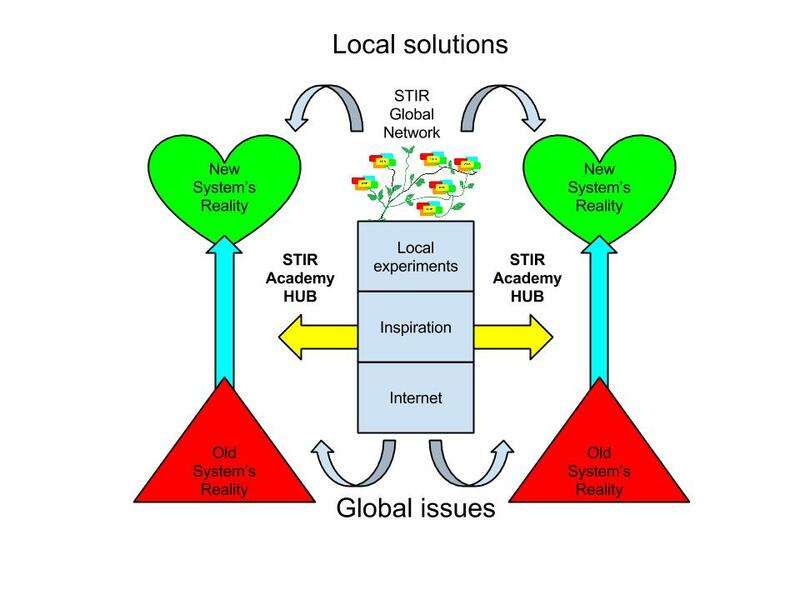 STIR Academy offers the framework and purpose criteria, the inspiration network and international infrastructure. The HUB takes care of local public, the choices and translation to local initiatives and projects. Since 2005 I have personally organized over 25 encounters in zoo’s, business enterprises, nature, schools, etc to experiment with awareness development, new education, applied knowledge, etc. The one who learned most was I myself. I expressed my learning in 7 locally published books. Since 2009 I set up the STIR Foundation to take responsibility ourselves for the redefinition of human complexities and the transformative process of moving from one paradigm to another. 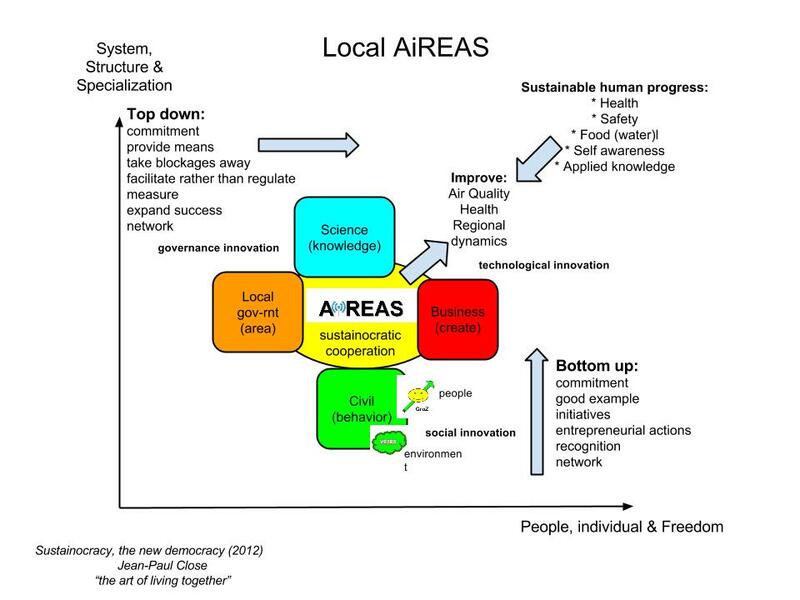 In 2010 the first Sustainocratic ventures, involving government, science, business and large local civil populations were initiated: AiREAS, VE2RS and STIR. The learning continued, especially about the human complexity itself, prior to system’s thinking. In 2013 I stepped up to a holistic view of system’s reality, managing 4 traditional paradigms together into 1 for sustainable progress and harmonic wellness. The first online skype conference organised by STIR was in 2009 with Herman Wijffels (old World Bank chief) as online speaker. He referred to the changing world including finance and banking. The first international HUB was started in Madrid in 2012 but did not survive. 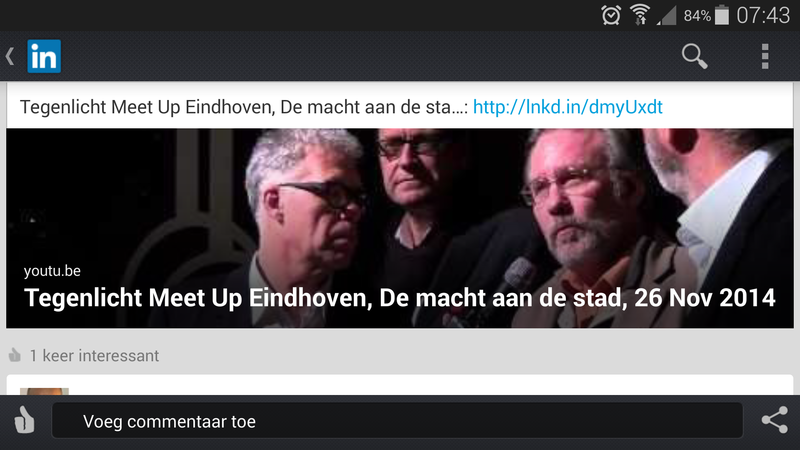 The first HUB was started in Eindhoven in 2013. It started with one session per month in 2013. In 2014 we have 2 including international inspiration. Initiatives are developing in Barcelona, Budapest, Brussels, Taipee, Miami, enz, as well as city quarters in Eindhoven. Often the initiatives are started from the old paradigm of economic dependencies and fail. It is a local learning process to let go of the dominant old paradigm first. 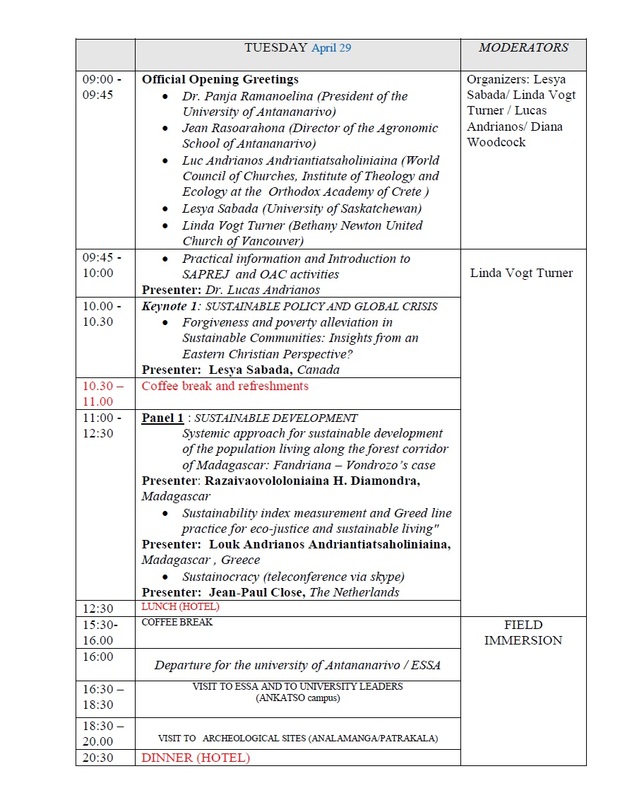 On April 29th 2014 STIR participates through skype in the world congress on poverty Madagascar (see below). STIR works on the basis of free membership, reciprocity and commitment. * Reciprocity means that if the STIR networks uses inspiration sessions from you, you get 1 to 1 sessions back for your own use, on call and mutual planning. So if you trade inspiration you will have 100s of free speakers at your disposal, else you pay a modest price. * The real art is to do something with the inspiration locally in your own environment. We look for commitment to work together on change that affects the world and our societies positively. Life is full of choices. And choices have consequences. Take this chain of historic choices for instance in the Netherlands. The peaks in every picture are directly related. Now that our air is polluted, being number 1 cause of death in the public space, what should our next choices look like? 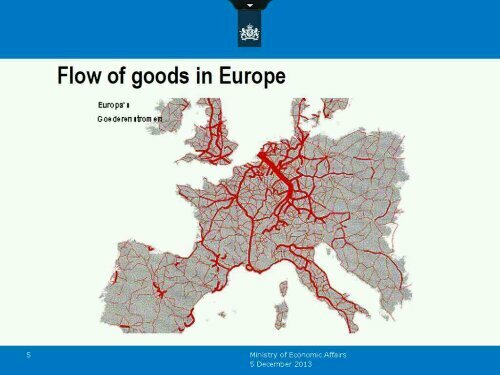 The Netherlands choose to be the center of goods distribution for Europe ever since we discovered the waters for worldwide commerce. Our geographical positioning and trading history made the development of the large Rotterdam habor and infrastructures a logical choice. 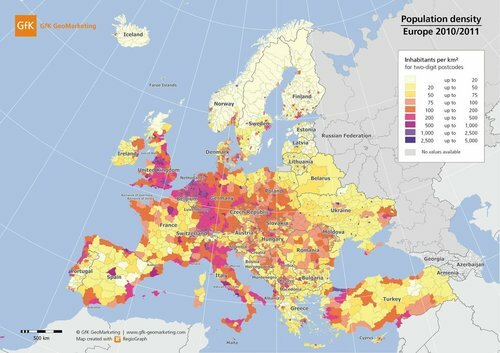 Since Europe decided to focus on consumption (leaving productivity to low wage countries) the combination of distribution, infrastructure and city development became economic growth patterns. Cities are ideal, concentrated consumer platforms for economic efficiencies. Choosing to use fuel combustion as mayor source of energy for mobility, heating and movement of goods shows consequences of premature death directly related to air pollution from burning fossil fuels. A large, services economy around the consequences develops. The pollution contibutes to global warming with the consequence of sea levels rising. Large investments are needed to protect the Dutch mainland against the sea water. If this process continues large parts of the mainland will be flooded at places where the biggest city development has taken place. How do we protect millions or even billions of people? When I choose to move from Spain back to Holland I noticed the equivalent reduction of quality of life due the combination of materialistic economic growth focus and growing consequences on health and environment. As a consequence my awareness developed around complex ethics and responsibilities. It became my choice to invite key local responsibilities (government, science, citizens and technology) to address People, Planet, Profit together rather than separately. Sustainocracy was born and AiREAS Eindhoven our first venture. AiREAS is the first sustainocratic venture for healthy environments from a air quality point of view. Choices are based on circumstances, opportunity and awareness. What would happen if Europe would change focus from consumption to productivity? What would happen if economic value would be given to positive human interaction rather than materials and goods? What would have happened to my awareness if I had stayed in Spain instead of moving to Holland? How can Holland cope with health responsibility when its economic positioning depends on unhealthy practice? What choices can we expect? What would happen if we did nothing? Analysis of choices, consequences and sustainable human progress is becoming a modern science of its own. But whatever the outcome, the transformative reality is clear. If we do not work on those global issues locally with solutions fast we will be surprised by chaos and disaster. We will pay the highest price ever. Death. Now we still have a choice. This is not an attempt to make any suggestions or even fun of the male tradition of successions of popes in the Vatican. The masculinity of this position closest to God has been formally inherited from the Apostle Peter who witnessed part of the life Christ and established a church in his name to pass on the holy Word. In reality the Church became the parallel structure next to Greed, the moralization of a celestial responsibility and the humanized absolution of Guilt. Two very masculine worlds of “the doing”, with abundance of hierarchy, power and control. It is said that when the Roman Empire collapsed the high level bureaucrats from the Empire crossed over to the Church as bishops. Thus they could continue their elevated position and avoid personal chaos or, worst even, the anger of the public tribune that would most certainly blame them for the collapse of the empire. But this article is not about the disputable morality in churches. Morality and Ethics have nothing to do with hierarchy, external powers or authorities of control in name of God or Money. It has to do with the inner learning process of what is truly meaningful in life, the existential processes of learning “to be”. This is a recognition of birth as a Holy miracle of life, the power of evolution and the secrete to eternal human progress. The cradle of birth is in the womb of our women and hence the true wisdom of ethics and morality is feminine. If anyone should symbolize this it should be a woman. 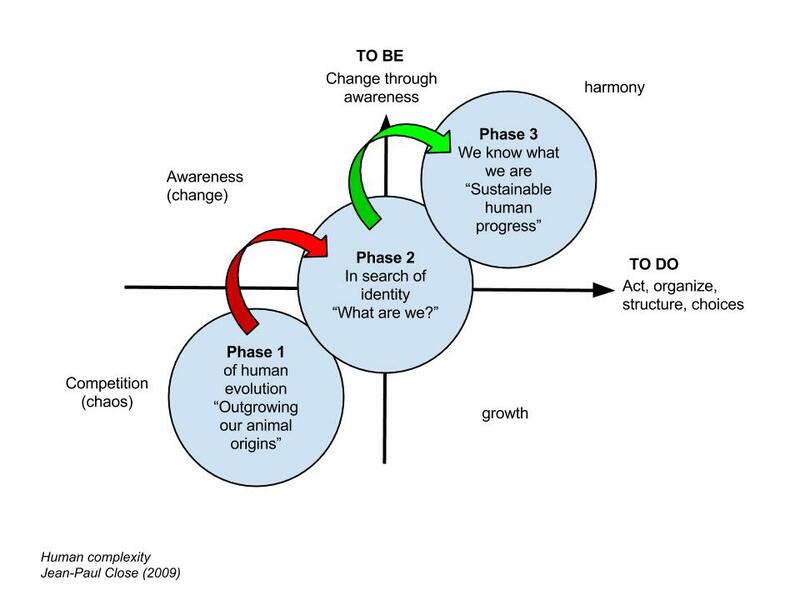 In my model for human complexities I show the continuous battle between “the doing”and “the being”, the masculine and feminine that together clash and create progress. Both men and women are the same but essentially different, the yin-yang of life that melts in a burst of harmonic excitement to generate eternity through renewal. TO BE is Feminine, TO DO is masculine. Ideal society is in positive progressive conflict between the two. In our money driven era the masculinity of the doing has also extended to the women. In consumer economies women have become as masculine as their counter parts, emancipating for financial independence at the expense of femininity. In the area of greed (see drawing) the true feminine meaning of “being” has been abolished. Its evolutionary meaning has been taken over by the meaningless invention of money and individual financial independence within the modern tradition of financial growth. Money indeed has freed women from a home bound slavery and formalized equality in human rights between men and women in many parts of the world. This tendency is well received and essential for sustainable human progress even though the original motivation to free women from their masculine suppression has logically been more economical and political than based on universal truths and ethics. Nevertheless it allowed a new culture to arise in which the true equality can be developed in a new era of awareness. Meanwhile the system of freedom has made men, women and their children slaves of the consumer driven economies. There is no ethics or morality anymore in this society that has abolished every little piece of interpersonal warmth to procreate and educate our children with true universal values. Human equality is in the right to consume and create debts. We have exchanged our existence for short term cash and hunt for it in a generalized, dominant masculine institutionalized way. The “underworld” I call this, since it is the world of fragmented, individualized greed and chaos below the horizontal line where most of humankind resides today. We are equal in “the doing” and had to deliver our identity, “our being” to the system. With the current crises in the financial world a lot of people are waking up. When we loose our protective securities from a virtual system than we learn to see our dependence and naked incapability of self sufficiency. We notice that we have been neglecting our children out of selfishness. They grow up cold, rational and individualistic. Some call it “the lost generation” which I hurry to dismiss our of experience. The adult ones that suggest this loss of a generation are the same ones that have lost faith in our youth to continue the destructive life style and attitude of their parents. Many young people look at life’s challenges indeed in a different way than their parents. They feel the need for the interpersonal warmth that they have missed when mum and dad were both working overtime for their individual independence. They tend to want to do it differently and start to search for meaning in life. A meaning that they have not been taught at home or in the schools where everything was focused on robotizing the children into a materialistic, rationalized system with its inhumane expectations and devastating nature. The pollution of our environment, the crudeness of abuse of a financial system in hands of modern criminals against humanity, and our universal vulnerability (as shown so beautifully in the overview from astronauts that brought us a new perspective of MOTHER Earth), together with the collapse of the consumer economic systems shows us the crude devastating reality the hard way. We have lost track of our true inner values and became addicted to our own externalized greed. We have reached the rock bottom of the vertical line, the part were only the having counts and we eliminated our consciousness, our awareness, our identity and even our guild, surrounding ourselves with fake securities, worshiping money above our selves. Until we wake up and find ourselves in panic, in personal chaos and pain. We loose everything we have just to find out that we are shamefully without identity anymore, a robot that does not know how to live LIFE. We are a number in the system and when freed we discover that we do not even know anymore what ethics are, let alone live to it. We have to learn to be human again and interact in community within a universal reality. We have to break out of our imprisonment and find a new harmony with our surrounding. In my own spiritual experience this illumination is immediate when time has come. The warm touch of God deep inside opens up a river of spiritual energy that cannot be stopped and acts like water through mountains. It does not allow itself to be blocked by obstacles and flows straight up the line of intense awareness. It represents a spiritual birth that lets go of old dependencies and looks at life from the perspective of a true universal identity, God alike. Bottom becomes top with the challenge to interact in a different way than before with one’s surroundings that still resides in the entrapment. Freedom and true equality are contagious and slowly others find their own inner light and fire. We save ourselves and let humankind travel the “TO BE” line, the feminine line, all the way up to the highest level. We feminize the human globe and identify ourselves as a species that is vulnerable to itself but also able to recognize that when time has come and do something about it. There is absolutely no reason, with all the historic awareness, lessons learned and modern scientific knowledge, that we cannot pass on to the upper layer, the “world above”, the heaven on Earth of true Ethical values, true feminine and masculine equality in its essential differences and create sustainable human progress for ever. It is a new world downside up, flipped over. Many people, including myself, already claim that Sustainocracy is such tipped over approach that is accessible by mere choice. It symbolizes the “TO BE” process also in society, business and education as well as society as a whole. It is an instant switch that makes everyone look differently at our selves and our surroundings acting accordingly. The a complex process of co-creation starts where we build a new society in harmony with our universe and leave the atrocities of millenia of destructive learning behind for ever. If for thousands of years masculinity has symbolized this learning world through kings and popes, time has come to change our symbols and start living to it. That is why I say that the next pope…..is a woman, without a church. She resides deep inside all of us, man and woman, to finally bring justice and balance in a troubled, adventurous species. When I started my consultancy group of self employed coaches, and later my STIR foundation that creates purpose driven cooperatives, I came across this interesting human phenomenum: the process of letting go leadership to gain true leadership. I made all my instruments, models and views freely available to anyone who would want to use it. 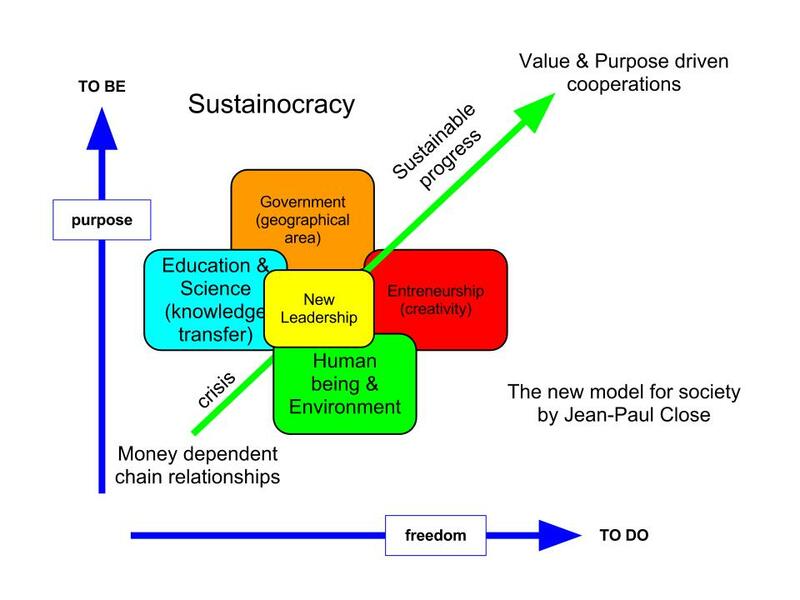 The 5K method for 21st century entrepreneurship, UNITED for effective teamwork, the pyramid paradigm for institutional positioning, the model of Human Complexities, MultiDimensional Entrepreneurship, the Index, etc and finally the new model for society: Sustainocracy. If people had open access to my toolbox they would use it and contribute to the world change, also without my involvement. By letting go of my control I could gain much more than by keeping it all to myself. I invited people to work together with me on the basis of equality. Since I was the source of the toolbox I had a better understanding of how we could use it. This knowhow I could pass on to partners in the process of addressing the world’s transformation. This would cost me time and I asked the people who joined to also count me in a little bit when I helped them towards successes. We started to form groups around my initiatives. My idea was to empower people with all my tools and help them to become successful. To my surprise this did not happen. On the contrary. People who joined me kept looking at me for instructions. When I organized meetings to create team spirit and develop a group attitude I would sit in front of the group and everyone in the group would be looking at me. Every member of the group would ask me for permission to speak or act and try to find a justification of action through my approval. How could I get the people to stand up and take responsibility by themselves? It had never been my intention to create a hierarchy but it simply occurred by de facto, even with self-employed people from whom you would expect a degree of entrepreneurship. In the group they acted like sheep in a herd, without the need to think, trusting the sheppard that he would lead the pack to green fields. It was a bit like asking the football trainer if he already had the world cup in his hands for the team even before starting the very first training. My consultancy group eventually fell apart, teaching me important lessons. Even though I defined world change in a consultancy method of my own the partners that joined me saw the innovation as a new way of accessing a financial market for themselves. The purpose of my innovative method still belonged to me, even when giving away my tools. The partners recognized themselves in parts of the execution and expected me to do the convincing of the market of accepting the methods and purpose. None would take group responsibility. They considered their own relationships of their own and my relationships of the group. Group interest was combined with self interest, not the other way around. They had come just “to take” not “to bring”. So when I started the STIR foundation I needed to put this learning curve into practice again. When you really want the team to grow and the purpose of the venture is right it is best leadership practice to step back into the pack or outside it all together. 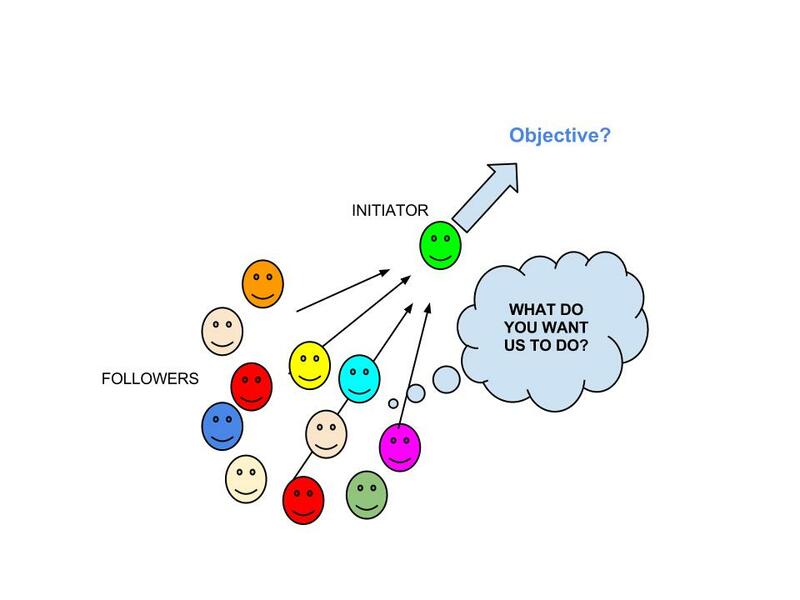 By doing so the group of followers become self-leaders again. If they believe in the objective they will go for it. If the objective is complex enough they may even work together. By stepping into the pack the initiator of the process shows respect for equality of all the talents in the group and allows the group to define the processes themselves. Someone who is good at initiation of processes may not at all be that good in managing them with large groups of people. They are different functions. A group of football players that all play left back never wins a competition. It is not the commonalities that make the group strong. It is the diversity in differences. That is why I defined the new age, multidisciplinary cooperation. 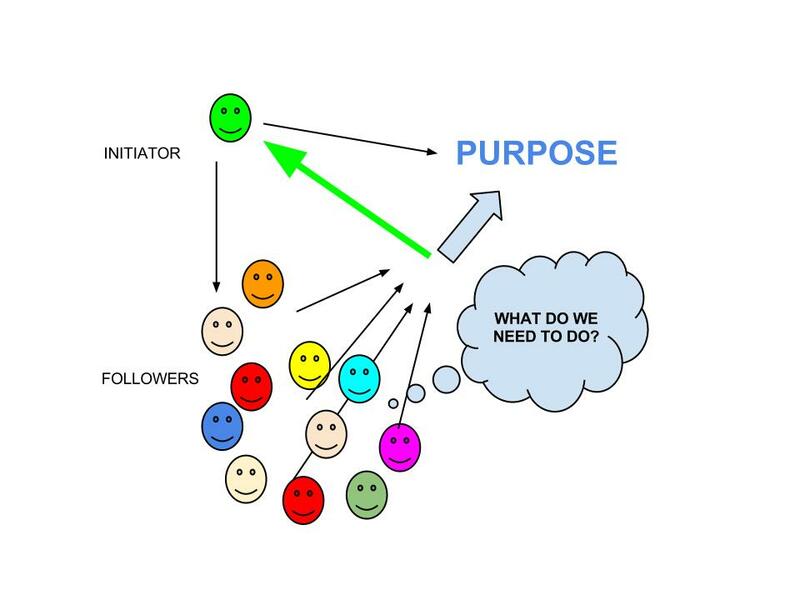 It is purpose driven cooperation in which leadership protects the group’s purpose and interests through result driven activities proposed by the group itself. The purpose of the group is not financial, nor of control, yet human and driven by change. The results obtained can have financial consequences for members in a variety of ways yet the essential purpose is always value driven. So when I start such venture I present myself as initiator, never as director or president. The entire purpose of setting the venture up is to step aside and let the members take authority by themselves. It is interesting to see that members are capable of scaling up the expected results to much higher levels than they would have done under a management structure. Like someone once said in one of my initiatives: “Jean-Paul, here I can blow my mind freely and make it come true”. This in particular is interesting in sustainocracy when also institutions take a seat at the cooperative table. Particularly government can gain power by releasing it. Try to gain a position of elected power to be able to do what they can’t say during the elections. Their leadership today is not based on any reality anymore but they are very good at making promises that they cannot keep. The lawfull dominance of politicians in a democracy in times of crisis is a type of leadership similar of a capitan that negates that his ship is sinking while his feet are already under water. The problem a territorial government faces in an open, globalized market is that all people and institution come to take and bring nothing. In order to take they have to pay taxes but these taxes should come from value driven processes. When a crisis occurs the value driven processes on which the taxation was based have become unstable. A government can raise the taxes or reduce the securities that people get. In the Netherlands the government developed into a dominant care taking organization. The community is one that sees the wellness of such care taking as a right and claims it continuously. As a consequence the central government has fallen every 2 years, new political parties stand up claiming that they can do it better and the old dominant parties manipulate to remain in power where no power can be exercised properly. This is not an issue just in Holland, it is a problem all over the world. I call it the power of the powerless because the capitan is running around his ship trying to fix each hole while the sailors and passengers just try to keep their own feet dry or strip the pieces of value of the ship for themselves. Meanwhile the capitan would keep shouting “full steam ahead”, trying to keep up the appearance that everything was alright, meanwhile causing the ship to make more water still. So when I found out the hard way that I had to take responsibility for my own life, it was not me who was to step aside but the dominant government, pictured as the foolish capitan in the metaphore. I found that I had the democratic right to take responsibility but the government would try to convince me to step back into the pack. My claims that the ship was sinking would be silenced by the political desire to keep up the appearances. Giving the territorial power back to the people was against the reigning paradigm and in a multiple party political system there were many capitans waiting for their chance to run around the sinking ship. I could not dismiss the entire government as a single person but I could ask government to help me build a solid ship alongside, respecting even the territorial authority of governance. In fact, what I did was to invite people to a purpose that I had defined and that was within the desired situation of governance yet could not be achieved by their own leadership. I was not relating to politics but to the practical reality of providing sustainable human progress in a region. Governance in a day to day activity is not far from the crude reality. Even though the structure is highly bureaucratic and risk avoiding by common nature of fighting a crisis by turning back instead of going forward, operational people inside are often blessed with common sense. They do not see my invitation as an attack on their authority but a way to make proper use of it. So in Sustainocracy local territorial government was asked to step into the pack by releasing their overall dominance and concentrating on their key responsibility: facilitating progress. They had to let go to receive more authority. After what I had learned in my foundation I could also deal with this process on such a large scale. The purpose became leading, I became the initiator of the process and invited institutions to take full responsibility within their own true powers of control and authority. My own role was that of initiator, connector and protector of interests. My role was also to break through that unjust hierarchy of unproductive control over anarchy. It took some time to make the very first venture happen but when people recognised that releasing power would give them back full authority, the first multidisciplinary cooperation (AiREAS) saw the light. Key in the process is that I always step aside, never asume a leadership role nor establish a new hierarchy. It is the group that puts in all its power and energy to make it happen, not me, making me the leader without leadership, a facilitator of powerful instruments to tool up together for sustainable human progress. With sustainable human progress as leading factor priorities can be choosen democratically that form multidisciplinary, purpose driven communities that work together on the line of progress. This is most affective when the territory is clearly defined. Multiple ventures can act at the same time in a self steering process of progress. Institutions, people and professionals can interact in different ventures freely as long as they contribute to the purpose driven goal. The only reason that I had to initiate the process was that no one else could. They all adhere to the old paradigm and cannot start a new one by themselves. They are instrumental to society but society itself is leading. So all I had to do was to ask the instruments to populate my toolbox, represented by the sustainocratic society that I had defined. I defined a new paradigm and allowed powerful instruments to reconnect in a new way. We were all showing leadership by doing so, releasing a piece of control to gain authroity in the new value driven communities. All people felt that they gained in authority by letting go. A true win-win-win…..
We have still a long way to go because in a fragmented, money driven society, most institutions and people hold on to their financial position to remain in control of their dependencies. They block progress by keeping their hierarchies tightly under control. To get them to understand that this is counter productive and eventually gets them into trouble is difficult. Many executives receive bonusses to keep control, not to introduce change. It takes courage to let go in order to receive authority back. As sustainocracy shows its effects by giving th example there where people unite that take the daring step, the rest will follow.